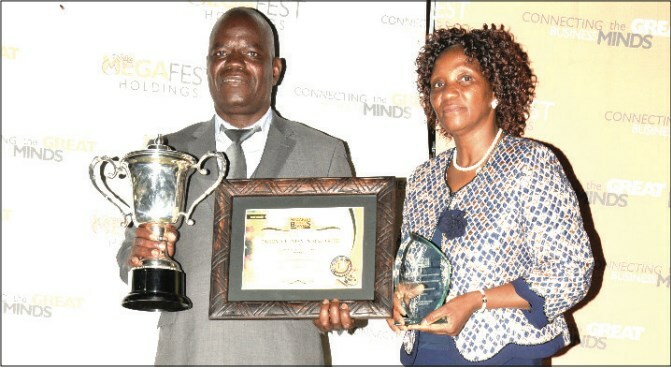 GREAT ZIMBABWE HOTEL - Benjamin Mazarire who runs Hillthru Enterprises, one of the finest micro-finance institutions in the country has been crowned the Megafest Businessman of the Year for Masvingo Province. He was honoured at a colourful event held at the Great Zimbabwe Hotel on the outskirts of Masvingo on Friday evening. Mazarire becomes the first person in Masvingo to win the award following the introduction of event in the province for the first time this year. Andrew Chekani, the N. Richards director for Southern Region is the first runner-up and he was recognised for his immense contribution to the creation of employment. The Mirror, the most widely read private weekly paper wrote its own piece of history when its General Manager walked away with the prestigious Manager of the Year Award. Mazarire recently established a $6million quarry mill plant which is 20km from Masvingo along Bulawayo Road which employs over 80 workers, he runs probably the biggest small scale gold mine in the Province at Summerton in Masvingo North. In 2017, Mazarire was the biggest small scale producer of gold from Masvingo Province. Hillthru has 13 branches throughout the country and is headquartered in Masvingo. He pioneered the financing of sugarcane farmers in the Lowveld after they struggled to access finance from established financial institutions. He also runs a number of companies and a 100 hectare farm in Ngomahuru area which produces fresh vegetables under irrigation and cattle ranching. All his companies in Masvingo employ over 350 workers. Mazarire is also a philanthropist of note as over 100 children in Mucheke have their fees paid for by the business mogul who is also an ex-combatant and former school head. He also donates to the Mucheke Old People’s Home every quarter for the upkeep of the inmates at the institution. For his efforts Mazarire received a floating trophy, shield and a certificate. The award was handed over by the guest of honour Dr Tinashe Manzungu of TM Holdings which is into construction and land development in the Midlands capital. “Let’s not create entrepreneurs, but successful entrepreneurs, we need to connect great business minds not just business minds if we are to grow the GDP for Masvingo Province and this has to happen now,” said Dr Manzungu. The rural district councils Chief Executive of the Year went to Peter Chibi of Bikita RDC who pipped six other councils to land the trophy. Georgina Mateta of the Traffic Safety Council of Zimbabwe scooped the Female Manager of the Year while Owen Munhuwamambo of Steward Bank won the Young Manager of the Year award ahead of his counterpart at Econet Edmore Mutisi. The Team Leader of the year was Evans Musara the acting Principal at Masvingo Polytechnic while Willard Mutsira the regional manager for Gain Cash and Carry was the runner up. 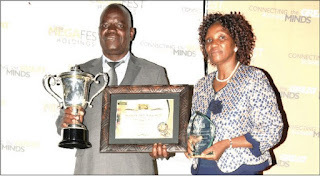 Tawanda Chimamiwa of South Eastern College won the Astute Leader of the Year, and his first and second runner-ups respectively were Masvingo Teachers College Principal, Benson Mutambudzi and Prime and Standby Power Supply director Samuel Makuvire. Martin Mubviro the Masvingo Rural District Council chief executive officer was crowned Public Sector Leader of the Year. South Eastern College, a private institution in Chiredzi was the runner up in Excellence of the Year award while Victoria Electrical Hardware won the Small Business of the Year with Dawnville Construction coming second. “This has come as abig surprise to us because we had come here to get stories little did we know that we will also walk away as big winners. The award is not for me or The Mirror team alone, but for our readers who are our biggest stakeholders. It is because of them that The Mirror is what it is today. “Despite economic challenges facing the country we are soldiering on week after week. I would like to pay tribute to our consultant, Matthew Takaona a veteran, passionate journalist and shrewd tactician,” said Mlambo after receiving the award. The Mirror is also now the most widely read newspaper in the Southern region, according to the respected Zimbabwe Advertising Media and Products Survey (ZAMPS). The Southern region covers provinces of Masvingo, Mat South, Manicaland, Mash East and the Midlands. The Mirror has a huge subscriber base mainly targeted at the policy maker and captains of industry.